Top row: GE, Cat #GM5A, General Mills Inc, Minneapolis, MN, late 1940s, automatic pop-up toaster, needs new cord, works, SOLD. 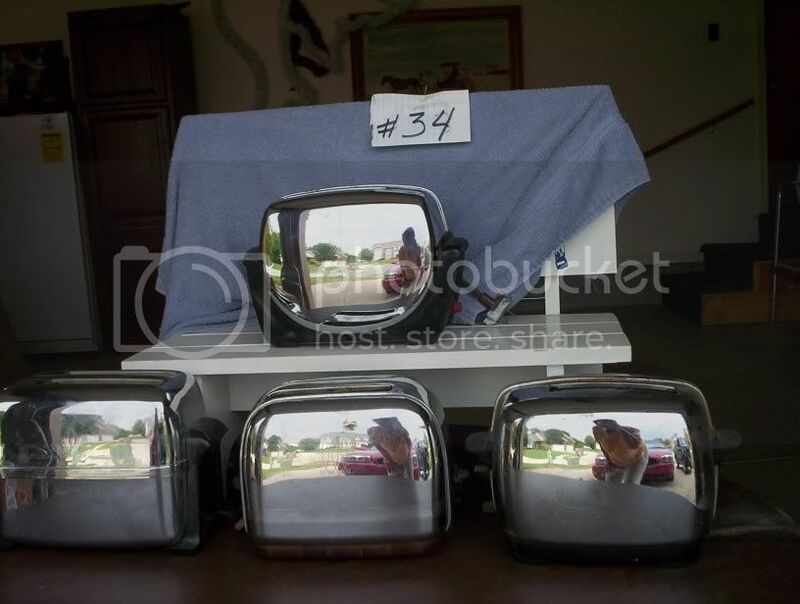 Bottom Row (L to R): Arvin Industries, Columbus, Ind, Model 4200, automatic pop-up toaster, Serial #213, very heavy, minor rust, works, SOLD; Dominion, Dominion Elec Corp, Mansfield, OH, Model #1115, minor rust, works, $35; Toastmaster, Mfg'd by McGraw Elec Co, Elgin, IL, automatic pop-up toaster, Model 1B12 No. A-2020177, heats up but doesn't catch when you push lever down, $20.